Helen Fowler contributed this guest post about her visit to Eastway Middle School. This article will also be published in the Chantilly Neighborhood newsletter. Ms. Webb not only shared a lot of information about Eastway, she led me on an extensive tour of the school. 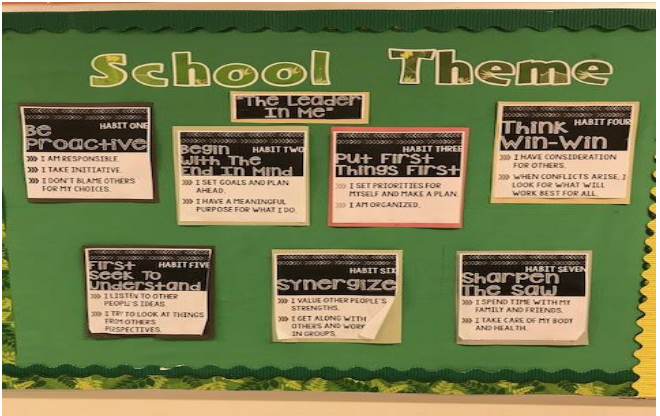 I saw students’ personal mission statements posted on hallway walls, along with great samples of student work. I witnessed students working in their coding class while they talked about raspberry PI’s as well as students making whisker plot diagrams in a math class taught by Mr. Gabriel, who has helped his students make some of the highest math scores in the state. Eastway offers its students a choice of study organized around three separate multigrade “houses,” each with their own curricular focus: Global Economics, Earth/Environmental, and STEM. These were designed in response to home feeder school concentrations and in accord with family preferences for academic disciplines identified in PTA surveys. Each house cohort has differentiation for students’ abilities and needs, including honors level classes. Joining a house gives a student priority in their house’s available electives. Each house involves students in multi-year ongoing projects. One of these is to make Eastway a hub for farmers’ markets, so that students can apply math skills such as calculating percents and ratios to real-world endeavors. 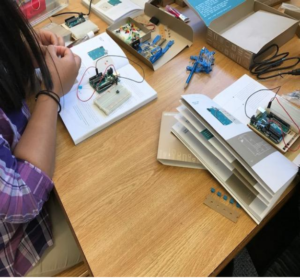 Through these projects and an array of clubs, these educators seek to involve students in learning global economics, green architecture, environmental protection gardening, 3D printing, coding, music, art, and more. Eastway qualified for Project Lead the Way coursework, a well regarded curriculum for rigorous, hands-on 21st century problem-solving experience. Ms. Webb and the faculty strive to cultivate a learning climate that supports future thinkers who can think beyond right now. The biggest challenge facing the school is attracting more students from the surrounding neighborhoods to diversify the student population. The low test scores at Eastway have been a deterrent for some parents who are concerned about school quality. Presently, out of a student population of 800, 62 percent (or 500) are ESL (English as Second Language) students in various stages of progression. Their lack of facility with written English often puts them at a disadvantage with standardized testing. Ms. Webb believes that an inclusive school can present advantages to all students, especially with the intercultural connections available to potential students. Beyond the development of kindness and acceptance of differences that are great assets for children, there is economic value to diversity. With the right school climate, diversity can spur innovative thinking that can eventually pave the way to new market creation in the future, providing our children with opportunities we don’t even see today. Ms. Webb said that parents can play a big part in making this happen. There are many opportunities open to unify the community in its rich diversity. Ms. Webb encourages you and your neighbors to visit the school and take a tour.